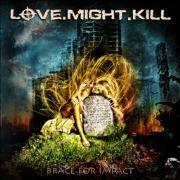 German/Italian vehicle LOVE.MIGHT.KILL debuts with their classically tinged debut. Boosting members like FIREWIND/ULI JON ROTH/METALIUM drummer Michael Ehré and excellent vocalist Jan Manenti plus the ex. CROSSROADS guitar duo Christian Stöver and Stefan Ellerhorst the band do their take on fans of DIO and JUDAS PRIEST. Not an easy task, but an area that needs an addition or two these days. Are this lot of the right caliber? The odd and the well-known goes side by side in opener “Tomorrow Never Comes”. There is some ZAKK WYLDE in the riff, in all oddity, as well as a good refrain. There are actually better openers around, but it is not a bad choice. It is not of the same excellence as the “I Speed at Night-influenced” “Calm Before the Storm” or the DOKKEN-esque “We Are the Weak”. The DIO worship in tracks like the abovementioned, or the DIO-feel in the lyrics of the less smashing “Caught in a Dream” is coupled with the Teutonic feel in the polka speed of “Down to Nowhere”. I nebver thought I´d say this but it works. They do a heavy interpretation of MAGNUM in the melodic “Reach Out”, a mix that I have been waiting for to happen. Closing track “Love Will Remain” feels like a combination of DIO and THE POODLES, of all odd mixes. But it works very well. The riffs are not as straightforward as you might be used to, but Christian and Stefan make it all work out fine. This album is what you are looking for to satisfy your needs of heavy metal the eighties way, but in many ways not. No matter how odd it sounds I highly recommend this.